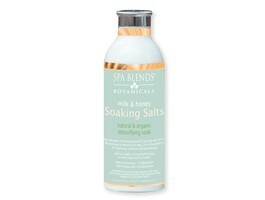 The Ultimate Soak for Hands, Feet and Hydrotherapy. 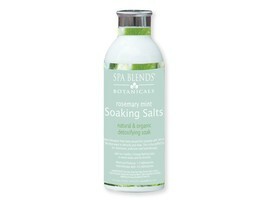 In Kelly's spa she used soaking salts in her manicures, pedicures and hydrotherapy soaks. She quickly realized that the feeling of rock like salts was not relaxing but irritating and distracted from the whole experience. 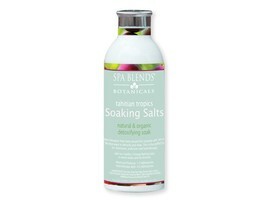 Spa Blends Soaking Salts are ultra-fine and powder like. They quickly dissolve in warm water. Key Ingredients / Dead Sea Salts / Contains 21 Minerals, Sunflower Oil, Ultra-fine Sea Salt. 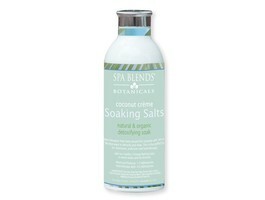 Coconut Creme Soaking Salts 8oz. French Lavender Soaking Salts 8oz. 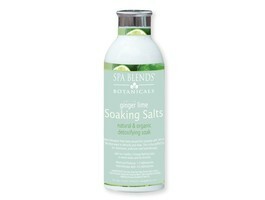 Fresh Mint Medley Soaking Salts 8oz. Peppermint Hope Soaking Salts 8oz. Sweet Pumpkin BlissSoaking Salts 8oz. Tahitian Tropics Soaking Salts 8oz.